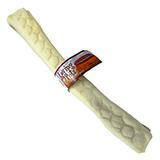 100% natural beef rawhide dog chews rolled up "jelly roll" style! These chews are a high protein, low fat chew treat for dogs. Satisfies your dog's natural chewing instinct and helps keep gums and teeth healthy and clean. These rolls are handcrafted and so size is approximate; roughly 10-11 inches long by 1-1/4 inches thick.